Find artworks, auction results, sale prices and pictures of Louis Vivin at auctions worldwide. Lot # : 113 - Louis Vivin (French 1861-1936) OOC Oil on canvas painting, featuring landscape scene. Signed and attr. Louis Vivin (French, 1861-1936) on lower right corner. 15.75 x 19.5 in (40.0 x 49.5 cm) lower section is indented, and lower left side has chipped paint, back of the canvas has signs of water damage and oil based material is bleeding through from the front (green in color). 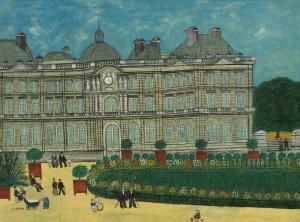 The subjects of Vivin's paintings were still life, hunting subjects, and the city of Paris. Vivin was a contemporary of Henri Rousseau, Camille Bombois, Andre Bauchant, and Séraphine Louis, known collectively as the "Sacred Heart Painters" and as masters of French naïve painting. Vivin's works are known to have a sad and dismal theme to them. He was also known for painting from his memory. Louis Vivin was influenced by the work and details of Jean-Louis-Ernes Meissonier\’s paintings. 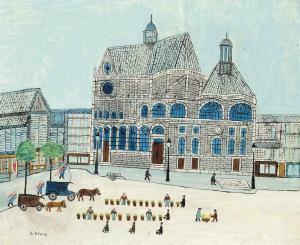 Louis Vivin\’s first one-man exhibition was placed at the Galerie des Quatre Chemins, and it was organized by Uhde in 1927. His later work was considered to become less dependent of the melancholy mood, and it focused more on blocks of color and form. 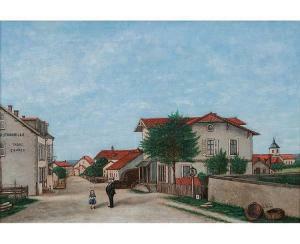 Louis Vivin Hadol 1861 - Paris 1936 In a small Town, Oil/canvas, 30,5 x 43 cm, lo. ri. sign. L. Vivin, min. rest., French painter. V. worked in a post office a. was autodicact as painter. 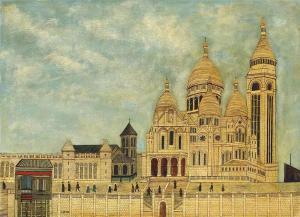 His naive paintings show views of Paris, but also landscapes a. still lifes. Like H. Rosseau V. owed his artistical breakthrough to the German dealer W. Uhde. 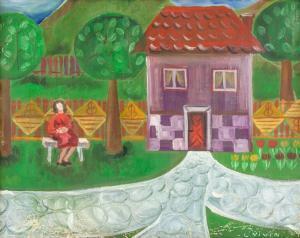 Paintings of V. were exhibited at the Documenta I in 1955. Please note that Olivier Lorquin has confirmed the authenticity of this work and not as stated in the printed catalogue. 21 1/2 by 29 in. The authenticity of this work has been confirmed by Olivier Lorquin. Acquired by the father of the present owner in the 1960s and thence by descent. Salzburg, Residenzgalerie, Die Welt der Naiven Malerei, July - September 1964, no. 107.